Heavy-Duty Cleaner Features A Noncorrosive, Professional-Grade Formula That Breaks Down Tough Grease, Grime And Oily Stains For Multipurpose Home And Do-It-Yourself Applications. Versatile Design Can Be Used Manually Or In Equipment, Including Parts Washers, Dip Tanks, Pressure Washers And Ultrasonics. The Cost-Effective Concentrate Can Be Custom Diluted For Specific Applications And Creates Up To 14 Gallons Of Cleaner. Heavy-Duty Cleaner Is Perfect For Floors, Painted Surfaces, Metal Surfaces, Engines, Wheels, Tools, Heavy Equipment, Grease/Oil Stains, Vehicles, Ovens, Grills And More.. 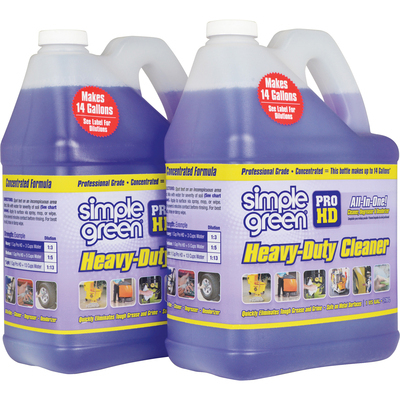 Heavy-Duty Cleaner Features A Noncorrosive, Professional-Grade Formula That Breaks Down Tough Grease, Grime And Oily Stains For Multipurpose Home And Do-It-Yourself Applications. Versatile Design Can Be Used Manually Or In Equipment, Including Parts Washers, Dip Tanks, Pressure Washers And Ultrasonics. The Cost-Effective Concentrate Can Be Custom Diluted For Specific Applications And Creates Up To 14 Gallons Of Cleaner. Heavy-Duty Cleaner Is Perfect For Floors, Painted Surfaces, Metal Surfaces, Engines, Wheels, Tools, Heavy Equipment, Grease/Oil Stains, Vehicles, Ovens, Grills And More.